Food is hands down the most symbolic and influential part of my life – I literally don’t think I can do anything without relating it to an item of food or a memory involving food. If you ask me what I did last week, I immediately think about what I ate. If we’re talking about places I’ve travelled to in the past, I have a little flashback to my favourite ethnic dishes that I’ve tried in different places and countries. Even if we talk about my cat, I think about Nugget’s favourite type of cat food – tuna and tilapia in case you’re wondering. Bottom line is that for so many of us, food has become so much more than just about nourishment for our bodies. Perhaps it’s the fact that I had to spend the last 3-4 months of my life learning all about the symbolic value of food, but I really think it’s such an amazing concept to try and wrap your head around. For me, there are three food memories that I hold super close to my heart – not only because what I ate was absolutely delicious, but there’s such an immense amount of sentimental value behind all these experiences. One of them was a few years ago when I went back to Hong Kong and my uncle took us on a day trip to Tai O, which is basically an insanely beautiful fisherman’s village surrounded by mountains and water. We spent the day walking around the water, experiencing the fishing culture there, and it was amazing when we ended the day sitting by the water eating a seafood feast in the most grungy and dirty restaurant ever. The second was from when I was in Florence with all my best friends in Grade 10. We were all exhausted from travelling on a bus for two weeks, and we were holed up in this seemingly drab hotel. But let me tell you, the pesto fusili we got that night blew our minds – seriously the best thing we’ve ever tasted. Now the third experience was the most recent, and is also the one that’s tied to a few other memories that led me to making this post/recipe. Back in June, my now ex-boyfriend and I went to a DAVIDsTEA press party that I got invited to at their Gastown location, and we decided to grab dinner at Nuba a few blocks away. Nuba is this really amazing Lebanese restaurant here in Vancouver, and we shared their “Feast for Two”. Everything was absolutely delicious, but their roasted cauliflower was probably my favourite thing of the night. It was heavily spiced with cumin and coriander, and came with the most delicious yogurt dipping sauce ever I still think about it once in a while. Aside from the fact that it started pouring and I got the right side mirror of my car whacked off later that night, it was probably one of the best days I had this summer. Flash forward a few months, and I was in my ex’s restaurant where he’s the head chef shooting their new menu of sandwiches. He had made this roasted cauliflower sandwich that was full of garam masala, curry, raisins, and yogurt and it was so freaking delicious I can’t even begin. Then last week, I went back to shoot their new wrap menu and he had made the wrap version of the roasted cauliflower sandwich. I left with one single thing on my mind. 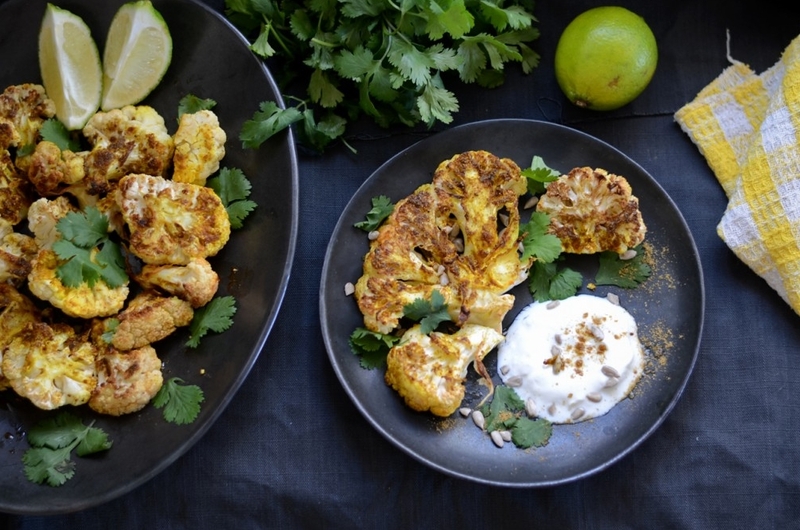 Something about roasted cauliflower is addicting and simply irresistible I swear to God. Perhaps it’s the way that olive oil seeps itself into some nooks and crannies, that cause it to blister and crisp up in certain spots while it steams and softens into a luscious pillow of cruciferous goodness in others. 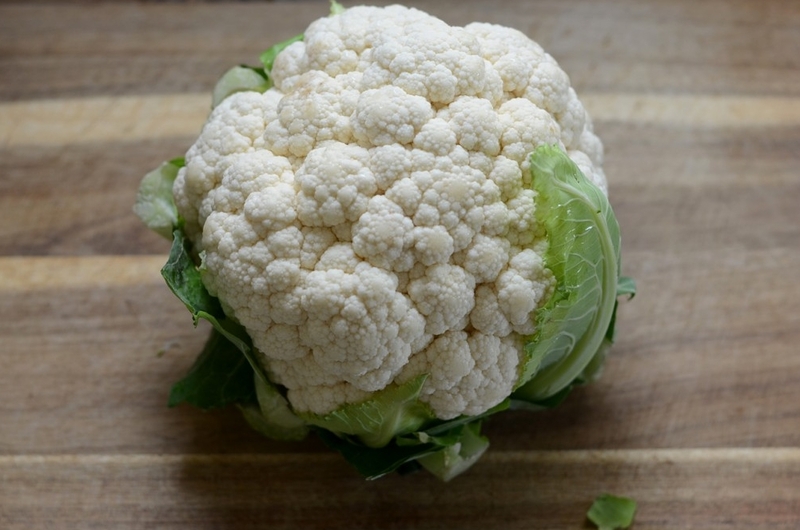 Also, I’ve heard that cauliflower is the kale of 2014 so I’m clearly bang on trend here. I combined the flavours of the cauliflower that I had at Nuba and that my ex made to the best of my ability, and this was one collision that ended up in pure spicy ecstasy. I went to the store earlier and picked up some garam masala, which is a spice blend involving lots of cumin, curry, pepper, cinnamon, bayleaves, and a heck load of other spices. I think it varies from place to place, but the one I got was super heavy in cumin which I absolutely adored. 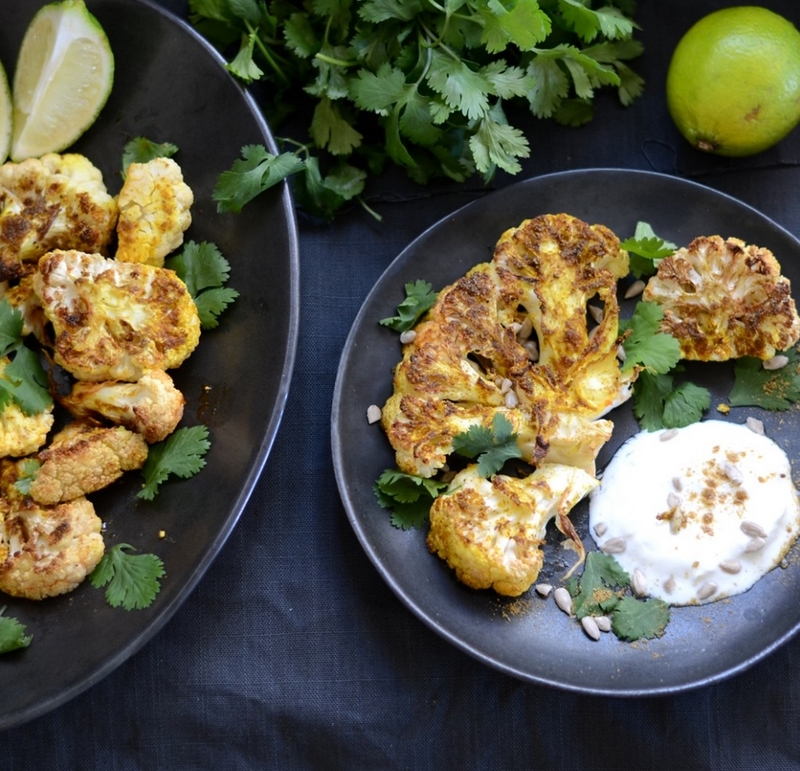 Also, not only is this delicious but it contains a crazy amount of antioxidant heavy spices, but cauliflower is also a great source of Vitamin C and K! So all in all, this dish would get two great thumbs up from your dietitian. Side note – my dietetics application is due in 8 days and I’m kinda freaking the f**k out right now. So go ahead and try this out, serve it as a Meatless Monday dish, or just as a side that’ll satisfy any hungry tummy! 1. 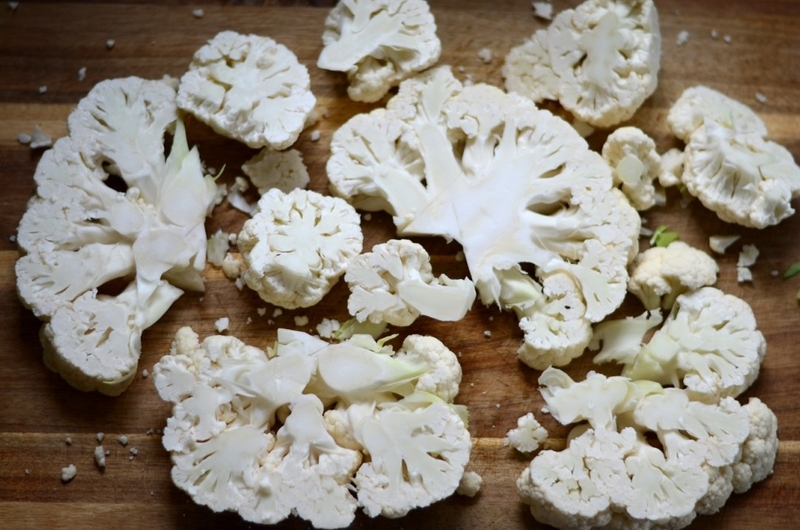 Cut your cauliflower up into even pieces. I like to cut it in large steaks and then break it off just so they’re uniform and will cook evenly. 2. Coat the cauliflower in the spices (which you can toast in a dry pan ahead of time if you’re not lazy like me), olive, and generously season with salt & pepper. 3. Preheat your oven to 450F and rub two cloves of garlic into the cauliflower. 4. Roast for about 30-40 minutes or until crispy and soft. 5. For the yogurt sauce, mince in a clove of garlic into the yogurt, as well as some salt, pepper, lemon/lime juice (just a little goes a long way), and some tahini if you’ve got it. Dust with a little garam masala at the end just to make it extra fancy. 6. Toss some fresh cilantro on top of everything, and you’re ready to go! If you’ve got leftovers, no worries! Crumble the cauliflower into leftover yogurt sauce or just plain greek yogurt, add in some chopped up apples, raisins, and tuna and you’ve got a perfect lunch for the next day! So try it out and let me know how you guys like it!